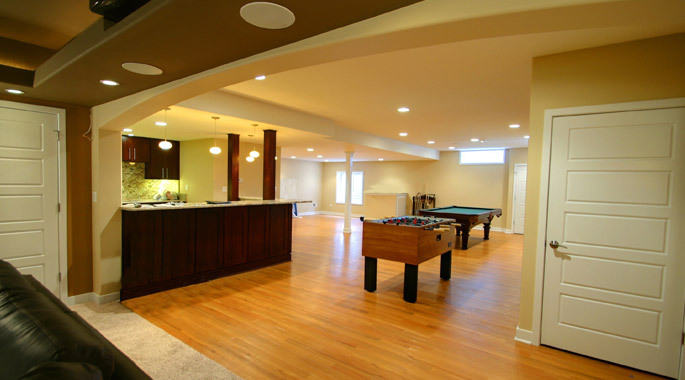 Our Naperville client approached us with the goal of creating a family entertainment area, as well as a dedicated workout space, within their unfinished basement. 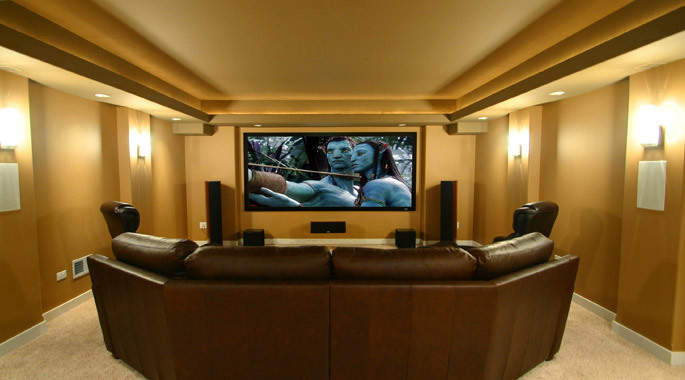 Features of this project include a state of the art home theatre, and a projection system with a massive 8′ screen, as well as a thumping, bone crushing sound system. 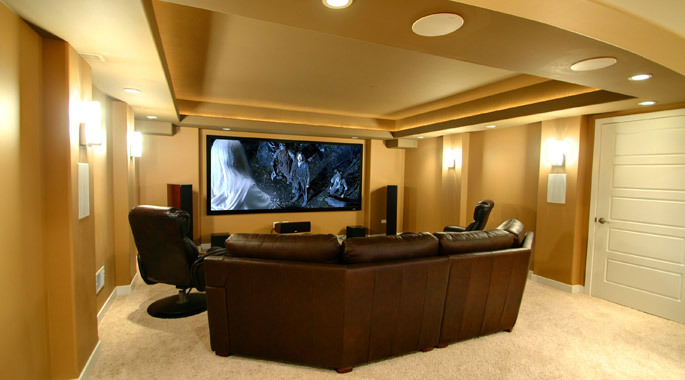 In order to isolate the sound from the rest of the house, two layers of 5/8″ drywall were hung on the ceiling with special clips, along with sound attenuation fiberglass insulation batts in the space between the ceiling and floor. The projection system was also hung on its own engineered beam that spans the width of the room and rests on the concrete foundation; this was done so that walking on the floor above would not vibrate the projection system. Other features include a dedicated gaming room with its own flat screen TV. Along with the entertainment areas of the basement is a complete mirrored workout room, as well as a private bathroom and shower. 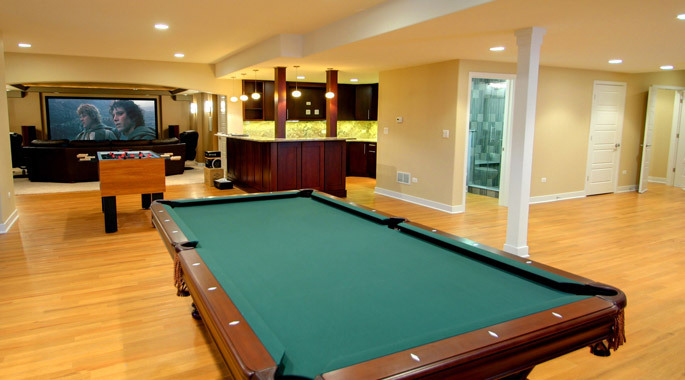 Gaming areas include space for foosball, ping pong and pool tables. 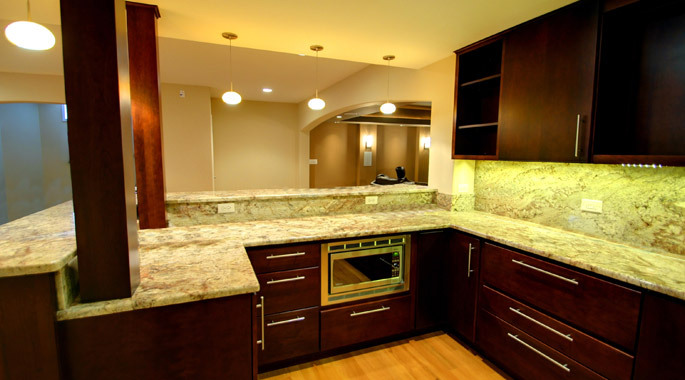 Rounding out the design is a full kitchen with bar seating and all the necessary appliances to prepare snacks and beverages that are required when having too much fun!